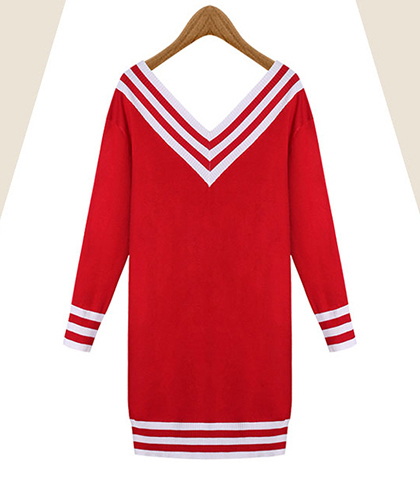 This lovely ribbed knit sweater dress has university style stripe accents across the shoulders that drop into the v-neck, then again on the cuffs of the long sleeves and repeated again at the bottom hemline for a continuous design flow. Bright red knit fabric features these white stripes which draw the eye upward and downward over your figure while the loose fit feels natural and comfortable for any season. This sweater dress can be worn over a pair of jeans for a casual appearance or alone if you want to wear it solely as a dress with dress shoes to work or for an evening out. Accessorize with a large leather handbag and fun jewelry to show off your neckline.